Let’s learn how to start a blog for promoting Affiliate Products to Make Money. Hey friends, last week I had published about starting an Affiliate Marketing Business without a blog. 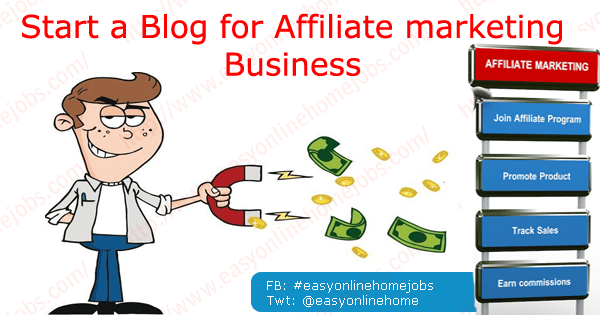 But in practice, and if you wish to make a sustainable long-term income, then start a blog to do Affiliate Business. Today, we are going to discuss this method in detail and come up with an idea of tools needed to start this lucrative business online. Let’s start with an Introduction about this passive business that already made many millionaires in the world and still making. Hey, you know what? I AM GOING TO BE ONE AMONG THEM SOONER. 2.) How does Affiliate Business Work? 3.) How to Start a blog for this Business? It is a performance-based business model where an individual can earn a decent income as a commission just for referring other merchant’s products or services. Find the best selling product on the Internet. Sign up for their affiliate program. Copy and install the Referral link and promote your blog. If someone buys the product, you get a commission. This is a general theory of the working of the Affiliate Business System. You should this article to get more in-depth knowledge and pieces of information about this wonderful system to make money online. You see, we will get a commission as an income normally for referring to someone else’s product or services. But you can ask how it is possible? It’s simple. Most Affiliate Business Sites have a unique special affiliate tracking link to track all the activities by the affiliates. When you register an account, you can log in to your dashboard and select the product for selling. After selecting, choose the promotional method and get the tracking link with your unique ID embedded in it. Just paste the tracking URL on your blog, social media sites, Whatsapp, and any other form of communication channels. When someone clicked the link, a small file called a cookie is stored on their computer or mobile, letting the merchant track further activities from the instrument. Whenever a sale was made, the cookie will send the information of the affiliate along with order and thus makes the business easy. Invoicing, payment processing, packing, forwarding will be taken care of by the merchant and you will receive the commission. So, I have explained you enough about this marketing business and you have learned how it works? We will now move into the practical process that involves different stages of starting and running a successful Affiliate marketing Business. I have separated this different stages into Six-Working phased for easy to understand the purpose. Now, take a note and a pen with you before start reading further, because my mentor says this, “Always take a note whenever you read something on the Internet”. This helped me a lot for my business with new blog post ideas, marketing ideas, and business development ideas. Affiliate Marketing Business revolves around selling a product either Physical Or Informational or services. If you look at all the business, there is a product or services and you are not going to sell anything newer or different. Choosing the right product is the first phase because it determines your business. You can promote anything, but that does not be a perfect affiliate marketing. Do I use the product? Does the product has higher demand? Do I have the passion for the industry? Whether the merchant offer Good Commission? Try saying YES, for all these questions, would be a perfect affiliate business I would recommend. You should not sell any product or services, that either you or your friends or relatives have tried before. People are knowledgeable enough to make deep research before buying a product. You can select any product to sell in the market, but it should be relevant to your audience. Products can be anything and from any industry like Ebooks, DVD’s, CD’s, Electronic products, computers, mobile phones, tablets, TVs, Jewels, Apparel, Kitchen appliances, Furniture etc. You can sell anything and everything if you having the marketing skill. But remember, the product should have more demand in the market unless you fail. Choose the product that can be pushed easily to reach out to more people because if you are selling the non-trending product, you can’t make a sale. I promote Domain name and Web Hosting tools such as Web Servers, Blog Software’s including Themes, Plugins etc. This is the trending product and highly moving product because, since these years, awareness Affiliate Marketing business through blogging has grown a lot. In the same way, if I choose, Apparels or jewels or kitchen appliances and start a promotional blog, then probably I would get fail as I don’t much knowledge in the field. Yes, you will fail if you sell a product you never heard about or haven’t tried in the early past. This is the next process that you should work out for your business. Most of the online products have their own affiliate programs specially designed for their own individual purpose. All you need is to find the hottest selling product on the market relevant to your niche. You can use Google Search for this purpose. If you already running a blog, then you can choose any one of the best programs from this list of High Paying Affiliate programs. Not all the products with affiliate programs are profitable because of the two reasons: Either the product doesn’t have the demand or the program doesn’t pay you a good commission. You should be careful before choosing the right program because you are going to spend most of your time exercising your marketing skill for someone else product or services. Whether they pay maximum possible commission for the product? Do the affiliate program has the products that are trending and having demands? Does the program has the international operations? What type of Affiliate Programs they have? Cost Per Lead(CPL), Cost Per Sale(CPA), Cost Per Click(CPC), CPM(Cost Per 1000 Impressions). The high Conversion rate of the product. In my blog, Easy Online Home Jobs, you can see some Affiliate Products and when you ask, do all the products are performing better? Of course not. Some product merchant will pay me after I made a sale. Some product merchant will pay me If I get them a lead. I am promoting on various products including E-books, Hosting Products, Software’s etc. Affiliate Marketing was in all the industry and you can sure make a good income with this method if you use wisely. Now, you may come up with the list of products to promote and registered an account with different affiliate programs. To leverage the income potential of this lucrative business, you need to start a blog. Because this is the only way to make passive income. Even, you can do Affiliate Marketing without a Blog, and I have covered this research article in my last publication, just click the link to read. But it will be successful only to small group of people’s who already created a brand name. We as a newbie should focus on creating a blog to promote our affiliate business. But you may ask HOW? We will discuss these easy to start steps in detail in this article further. You have already chosen the products for selling, but you need to know How to sell? You cannot register a blog with just blah blah names as this is the name of your online face. Your blog name should have a keyword included to get it rank easily by performing SEO tasks. Use Google Search Engine and SEO Softwares such as SEMRUSH, AHREFS to get ideas (or) list of keywords to name your blog. Once you come with up with a list of keywords, check for the competition and trend using Google Trends and other tools mentioned in this article: Competitive Analysis to name your blog with a killer title. This is the next phase of starting this business. With your keyword, write a possible domain name for registration. The domain name should be easily remembered able, keyword rich, not more than 20characters and the suffix of the domain should end with dot com. You can register a domain name with GoDaddy, HostGator and IndeedWebHost to be used for your business. Web Hosting is a special computer called Internet Server, where you will place all your blog files and later serve to the different client’s computer upon request from any part of the world. Purchasing a hosting is a crucial task in your business and you should consider all many important factors in your mind. Your server will be available online anytime and should be capable of the server every request. Also, the cost of the server should be affordable. You should purchase server closers to your demographic audience to serve your site faster. If your target audiences are from India, consider buying server from Indian Data Center. Now, purchase a premium Word Press theme and install on your blog. It is a very simple process and you can do this by reading the documentation that will come with your purchase. There are a lot of free themes available to download and install. Hire a designer to install it for you if you feel it will trouble you. A very nice attractive design and a well-structured layout are essential for the blog to get the decent conversion. You can purchase a theme from MyThemeShop for a cost of $59. For more professional look and appearance, you can buy Thrive Themes by click here. Your readers will be more likely to purchase the recommended products only if they trust you. You should add some value by providing useful information about the product or services, (or) write a review of the product. You can also ask some customers to send their feedback to your email and you can organize those contents to create a list of testimonials for your product promotion. Your conversion will entirely depend on your blog content and it shows the value of your blog. If a new visitor landed on your blog, he will first read what the information you shared and then makes a decision for purchase. If your content does not have the value to convince your reader, then you cannot make a sale. Writing a killer content for affiliate marketing is an art and you can read how to make it possible by visiting the article. Make sure your content is optimized well and eligible for Search Engine Ranking. The last process in your blog setup is placing your Affiliate URL on your blog page for promotion. There are different sources of marketing materials available such as Text Link Ads, Image and Banner Ads, Flash Ads, Splash Page Ads etc. You can use all materials (or) one at once to promote the product. After you placed the Affiliate URL, you should work more towards conversion by doing a lot of A/B test. In some places, text AD may perform better than Image or banner ad. Test with different materials against one another until you have achieved optimal conversion ratio. You have the product, blog, content and placed affiliate URLs. Do you think the work is over? Do you think people will start buying all the products you recommend? If that was your thinking, you should change your mindset. Who will buy the product through your blog, when there is no traffic. There are various promotional strategies to perform after you start a blog. You should spread the word about your blog here and there on different social media sites, and on other blogs through blog commenting, Guest Posting methods. Participate in Forums and use the power of Forum Signature to promote your product. There are so many ways of blog promotion to bring traffic to your blog. Normally all affiliate company’s pay you through payment processor such as PayPal. Some companies process payment via Direct bank transfer and cheque. if the affiliate is located within the territory of their primary place of operation(Within the same country). All commissions made in the present month will be processed in the next month first 10Days and start their payment on the mid of the month. All affiliate commissions are taxable and don’t forget to file your returns. i.) Start a blog to promote all products in one place and it’s easy to maintain. ii.) You can easily create trust and build a good reputation through blogging. iii.) When you added a newsletter form, you can send frequent newsletters to update a new product launch, thus helps increasing sales (Returning visitors). iv.) By publishing informational resources through your content, helps people to purchase and pushes them to recommend more in their network. v.) With a blog, once you created a stable traffic source, you can constantly make the sales. But without the blog, you should sit every day to post on different social media, WhatsApp, and others. i.) You cannot able to start making money from the Day-01. It will take time to build your reputation and trust. ii.) Need some investment in purchasing a domain name and software. iii.) Recurring payments such as Hosting Renewal, Email Marketing Software Renewal, and other related renewals included. iv.) Have to spend a lot of time writing new contents and posts about the product. The best way you can achieve success in Affiliate Marketing Business is to start a blog. Also, you can make some easy money until you finishing setting up the system to work for you. The system is, Right Product > Right Program > Well Deserved Blog > Decent Traffic. You need not to create your own product or any software or application to sell, but just for referring other merchant product you can easily make money. The biggest success in this business is to start by taking a small step which we have discussed so far in this article. Thanks for your time and patience to read my thoughts on How to start a blog for affiliate marketing business? and if you like it, then feel it and share it. And the best part is that I want to know your suggestions, thoughts, and comments to enhance my skills and shape this blog to be more useful to others. Have a successful day ahead.